Shady Plants - Mail Order Fern Nursery: 9 mixed ferns for living wall £30.00. 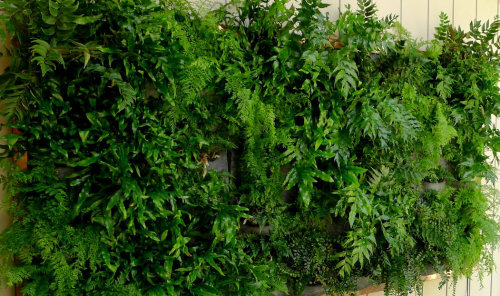 9 mixed ferns for living wall £30.00. Here is a selection of ferns that are suitable for growing in green, living walls and vertical gardens. They are all tough, very hardy, reliable even with restricted root space and look great all year around! They will of course need watering and a regular feed but once established they are drought tolerant, as long as they are not allowed to dry out completely. Water retaining granules, as used in hanging baskets, are ideal for those units that need manual watering. There will be three different varieties of ferns, strictly our choice, but all will look great from the start and will only improve as they fill in and develop. Do bear in mind that collections ordered from late autumn to early spring will not look as fresh as the new growth from late spring to late summer!